Every four years a huge chunk of the American population professes a sudden urge to move to Canada..."if that so-and-so running for the White House gets elected. "Usually "that so-and-so" is a right-wing Republican. 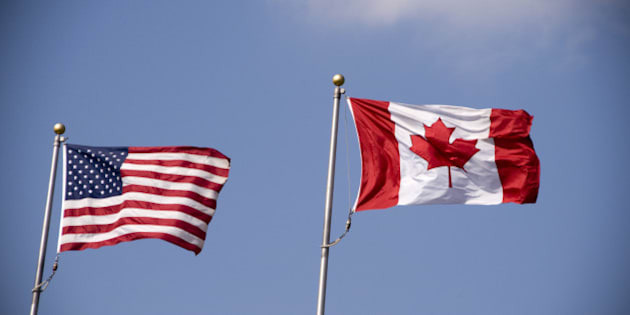 American and Canadian flag flying side by side. It happens as regularly as clockwork, once every four years. And 2016 is no exception. What, an American election? You're getting closer. Every four years a huge chunk of the American population professes a sudden urge to move to Canada..."if that so-and-so running for the White House gets elected." Usually "that so-and-so" is a right-wing Republican. And the people professing to leave are left-wing Democrats who think they can escape to some mythical socialist paradise. Unfortunately, they are wrong. Let's face it, people don't just change countries because they have a distaste for a politician. They sit it out to do battle next time. If everyone who stomped off with an "I'll move to Canada" followed their words with actions, the U.S. would be a Democrat-free zone. Elections would be no contest. This year, it's not some right-wing Republican that has 34 per cent of Americans packing their proverbial bags in anticipation of one result or another. According to the somewhat humorous (according to me) Infographic below, nineteen percent of Americans would move to Canada if Donald Trump wins. Donald Trump, a serial flip-flopper between parties, is on a mission to prove that trailer trash doesn't have to be poor. He plays the outsider card, and has been accused of being a ringer for the Democrats. His appeal is to blue collar workers - yes, union types. He just learned that the NRA can bring him votes; that's about as right wing as he gets. Don't set up the camps for American refugees just yet. But get this. Fifteen per cent of Americans say they would move to Canada if Hillary Clinton wins. What? Who are these people and what do they think they'll find different here? The Clintons have been trying to fashion the U.S. more in Canada's mould for years. I have a message for Americans: we have politicians here, too. Sorry, there's no escape. The predicted mass migration is not going to happen. People don't migrate just because they have a distaste for a politician. They migrate for serious reasons, such as to escape being killed in a war. Or to flee from persecution. Or to permanently raise their standard of living. According to the Infographic, the last big migration from the U.S. was by people fleeing the draft. By big, we mean 23,000. That's fewer than come each year from China. Fewer than come each year from India. Fewer than come each year from Philippines. Besides, talk on the streets has it that if Donald Trump wins, Canadians will put up a wall along the Canada-U.S. border. They want to make him pay for it, too. Now, a word about the pros and cons of moving to Canada, as listed in the Infographic, which obviously was put together by an American. Hockey is a pro. Check. Work-life balance, I don't see it. Everybody here has a side-hustle. It's just that in Canada the tax rates are so high that most people want you to pay them in cash. In the U.S., with lower tax rates, there is less temptation to go underground. As for poutine, I'll be happy to ship it all to California. But it's the cons that leave me scratching my head. Canadian Conservatism is a con? I don't know, but seems to me that Canadian Conservatism falls somewhere between Democrats and Republicans. I don't hear any great groundswell of Canadian Conservatives wanting to replace Canada's mostly functional health-care system with the U.S. system, not even the partially upgraded patchwork of the Obama years. Which brings us the "National Health-care System." This is a con? •	Every Canadian is covered. Nobody hesitates to seek medical attention because of cost. •	People go for checkups, get diagnosed earlier and have a better chance of survival, as a result. •	Nobody gets turned away because of inadequate coverage. •	Canadians pay half as much for health-care as Americans. •	We have more doctors, more hospital beds and healthier people. •	And we live about two years longer than Americans. What part of that is a con? Cold Weather, yes that's a con. That's a big con. Not much we can do about that. And "Credit Score"...if you emigrate to a new country, that's just part of the landscape. Sure, the U.S. leads the world in many ways. It's a great country. But Canada has so much going for it, once you discount the snow and the poutine. Nevertheless, don't expect a lot of Americans to seek refuge in Canada during the Clinton years or during the Trump years. They'll stay where they are, in familiar settings, near family and friends. They'll continue to rip their leaders apart on Facebook. And they'll rail about how they'll move to Canada..."if that so-and-so running for the White House gets elected." I think they rather like to hear how that rolls off the tongue.